Zack was in so many ways a typical 7 year old boy. He loved playtime with cousins and friends. 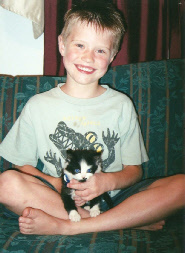 He loved video games, his swing set, and his dog and tiny kitten. He played soccer at the local YMCA. He was also a very unique child. For example, once he decided to hop like a frog on the soccer field during a game. He was also very tough. He’s the only child that I saw that got hit in the stomach by the soccer ball and didn’t leave the field in tears; he stayed in the game and kept on playing. Zack was always very smart. He could count to 100 correctly at the age of four. He did 1st grade math in kindergarten and 2nd grade math in 1st grade. I know that one day, when my time on earth has ended, I’ll see Zack again in our new home in Heaven. Until then, I find comfort in the precious memories of my time on earth with him.